Part of the Jordan Brand 2018 lineup will include the Air Jordan 11 Blackout, which will be making its debut beginning in May. Originally seen as part of the Air Jordan Blackout Sample Collection from 2011. Dressed in a Triple Black color scheme. This highly anticipated Air Jordan 11 features an all-new nubuck upper with a Black patent leather overlay and Blue tinted outsole. Look for the Air Jordan 11 “Blackout” to release on May 26th at select Jordan Brand retailers. The retail price tag is set at $250 USD. 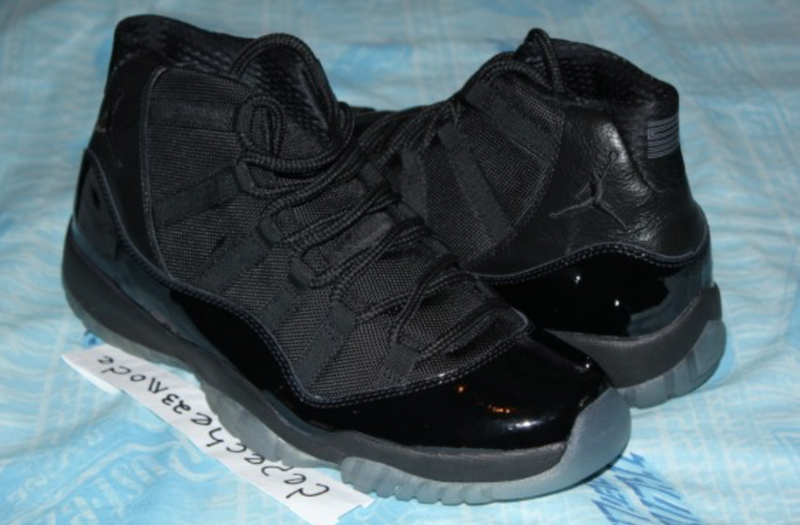 UPDATE: Here’s a first look at the “Prom Night” Air Jordan 11. This release replaces the leather and ballistic mesh on the original “Blackout” Sample for a nubuck upper. Photos: Pinoe77. UPDATE: According to DJ Folk, the “Blackout” aka “Prom Night” Air Jordan 11 will release on May 26th. UPDATE: First look at the Air Jordan 11 “Blackout” 2018 Retro Sample via @spicychickenwings.